We have not seen any evidence that any of these officials have actually endorsed Atterbeary, so we asked several of them what they thought of the mailer. Here are their responses. I endorsed the D-18 slate early on. I have not been in contact with Ms. Atterbeary and did not know that my photograph was being used in her campaign mailer. I believe that Vanessa Atterbeary has a bright political future - but she will not endear herself to future voters or future colleagues by using this type of campaign tactic. All elected officials know that any picture they take with someone could end up in someone’s campaign literature one day. Just the picture, of course. I’m in this picture and did not endorse Vanessa Atterbeary - though I know that I’m not the elected official she’s trying to highlight. And I have nothing against Vanessa - she might be a great person. Anyone in the picture could tell you that it’s from the Maryland Women's Legislative Briefing event back in January. Lilly Ledbetter was the speaker and we all wanted to be in the picture with her. Vanessa was the chair of the event so that’s why she was in the picture as well. 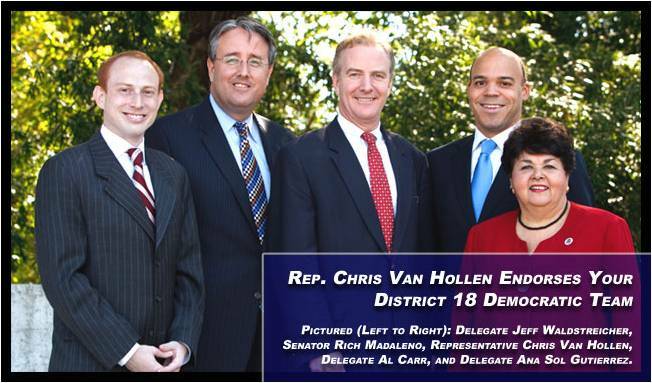 I am proudly supporting the District 18 Democrats: Senator Rich Madaleno and Delegates Al Carr, Ana Sol Gutierrez, and Jeff Waldstreicher. No, I am not endorsing her or other candidates. We all wanted to be in a picture with a gutsy woman, Ms. Ledbetter, to show our support of HER courage. I am very surprised to see my photo incorporated in this campaign mailer. 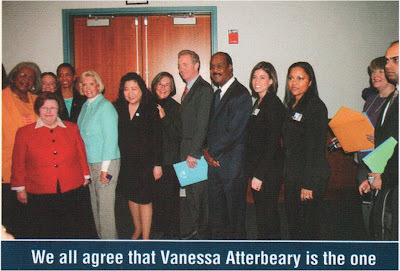 I attended the Commission for women legislative briefing not realizing that Ms. Atterbeary would utilize the photos for her campaign materials. I have endorsed the D18 slate, and I hope that voters are not mislead by this mailer. 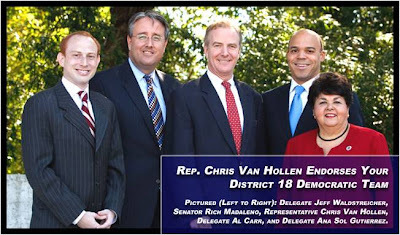 Congressman Chris Van Hollen, who also appears in Atterbeary’s mailer, has endorsed the incumbents and has even appeared in their literature. This campaign has lost all credibility by making illegal robocalls, swamping the district with illegal signs, getting a warning from the Town of Kensington, vandalizing voters’ cars and now sending out dishonest mailers which even Vanessa Atterbeary herself is now disavowing. Everyone is entitled to run for office, but no one is entitled to run a campaign like this. Disclosure: The author is the Treasurer of the District 18 Democratic Team. Who's Voting to Re-Elect Ben Kramer?